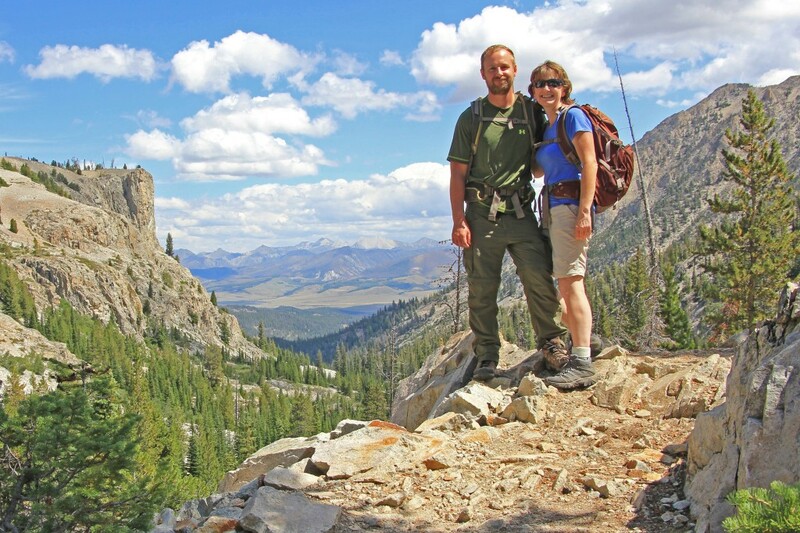 August is the best month for high elevation backpacking in our home region where the states of Washington, Idaho, and Oregon join. Trails are finally snow free, stream crossings are safer as the snow runoff has subsided, and the weather is almost always warm and sunny. The only down side is there could be a raging wildfire in the area. 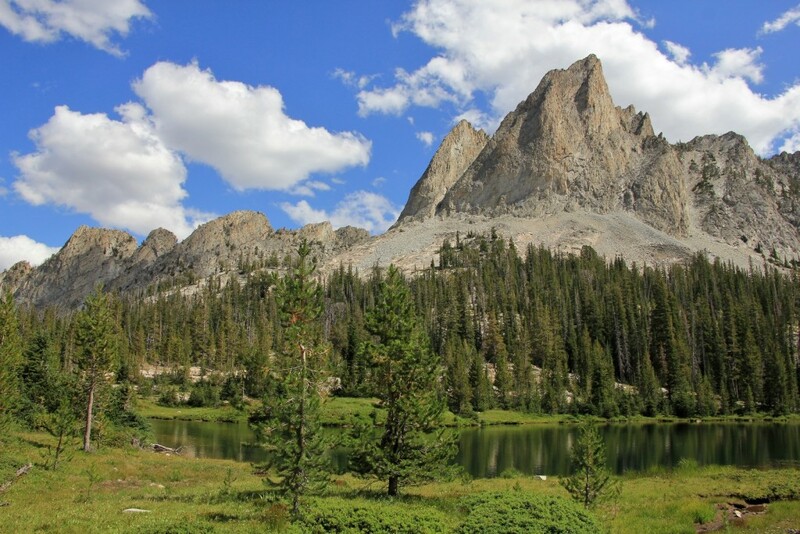 If you’ve never been to the Sawtooth Mountains of Idaho, you are missing out on a beautiful gem that reminds me of the Teton Mountains. 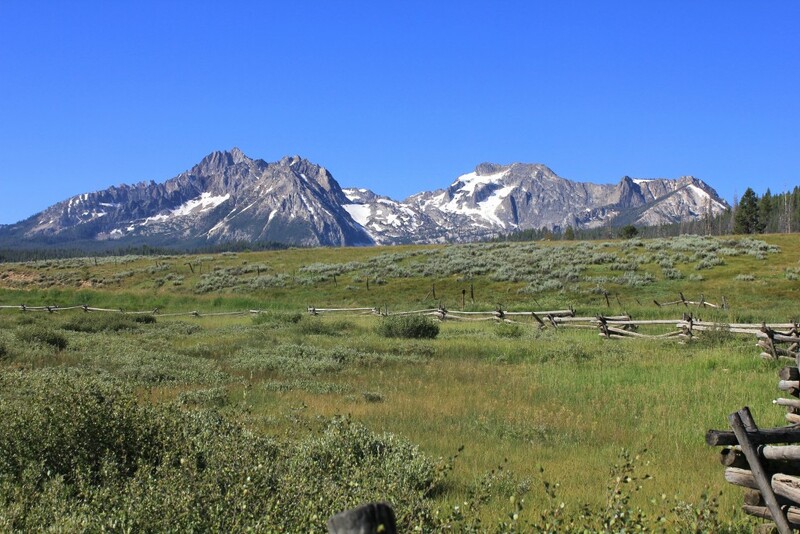 Near the tiny town of Stanley, along the banks of the Salmon River, the Sawtooths shoot out of the plains and reach for the heavens above. The upper most peaks are snow covered for most of the year. 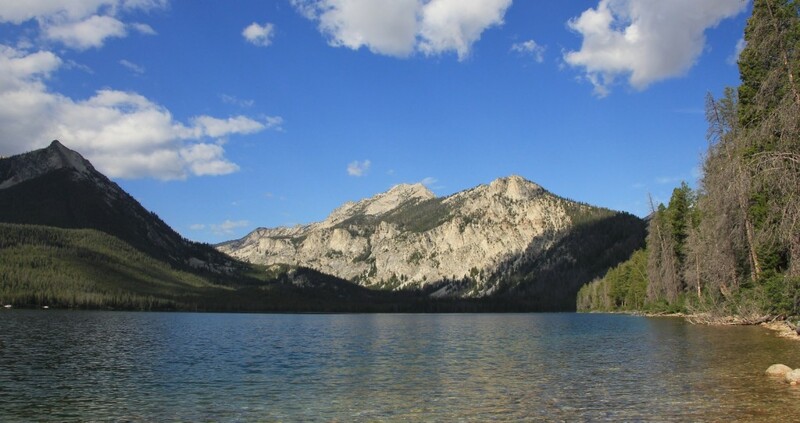 There are several beautiful lakeside campgrounds within sight of the mountain peaks, but they all fill to capacity and crowds just aren’t our thing. We headed northeast out of Stanley and found a lovely little campground along the Salmon River. Upper O’Brien Campground would be our home for the next couple nights. We selected a picturesque site with a view of the river. 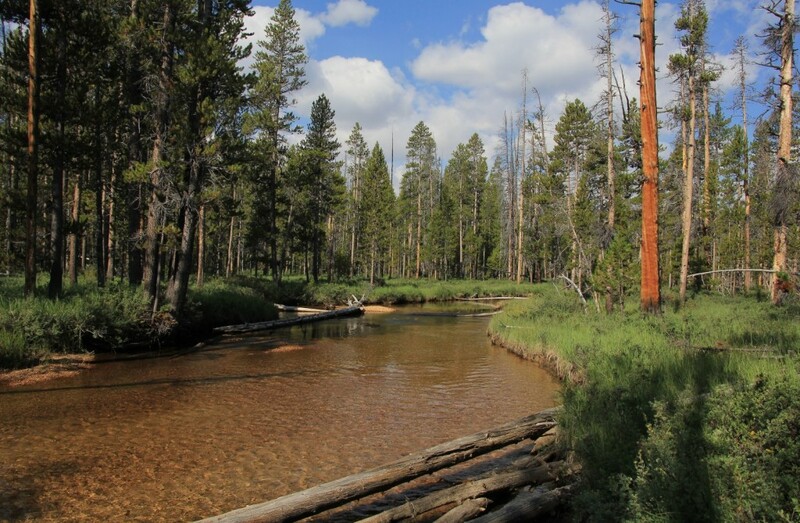 Typically, we aren’t campground people—we prefer dispersed camping in private spots within National Forest boundaries. But since we weren’t very familiar with the area, we decided to give this a try. Friday morning we enjoyed our beautiful Salmon River view while having coffee and breakfast. Then we grabbed our hiking gear and headed out for the day. We made the drive back to Stanley and continued south on highway 75 to FS Road #208 where we turned and continued on to the Tin Cup Trailhead at Pettit Lake. There is a large parking area at the trailhead and it was already at least half full. 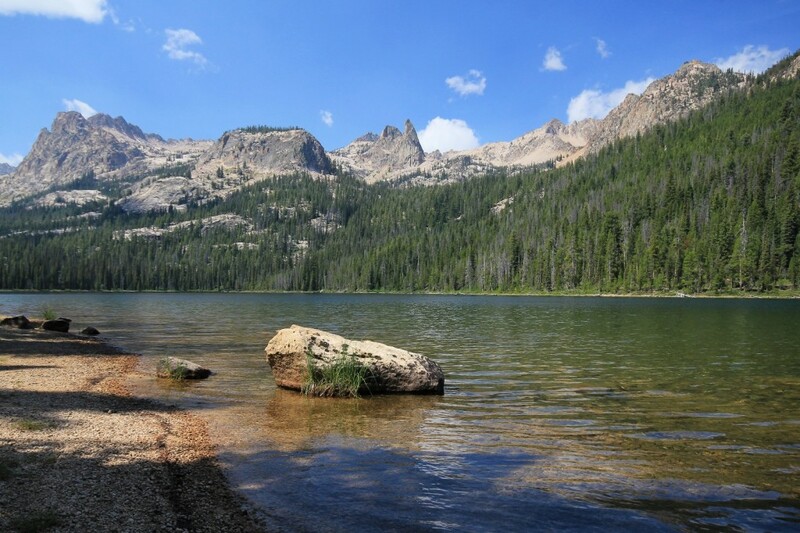 This is the start of a popular backpack loop to several high mountain lakes including Alice Lake, our destination for the day and one of the premier locations in the Sawtooths. Temperatures were already very comfortable and would remain so throughout the day. Two happy hikers hit the trail. 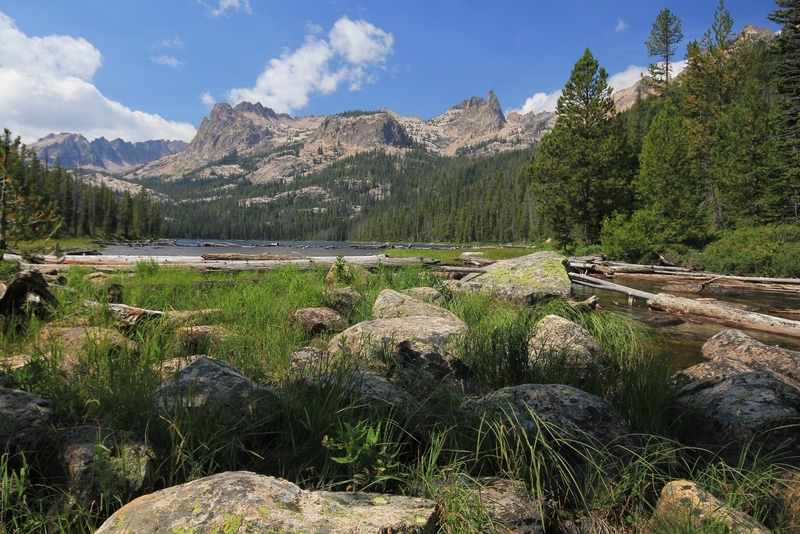 The first mile or so of the Alice Lake trail followed along the Pettit lakeshore at just under 7,000 feet elevation with nice views of the lake and the Sawtooth peaks ahead. The trail was in great condition and it was very easy hiking. 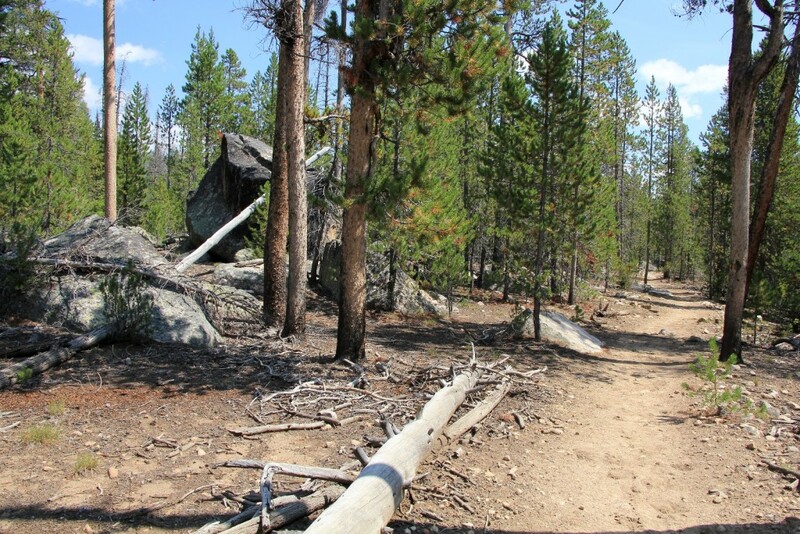 After about a mile, the trail left the lake and continued through relatively dense forest. 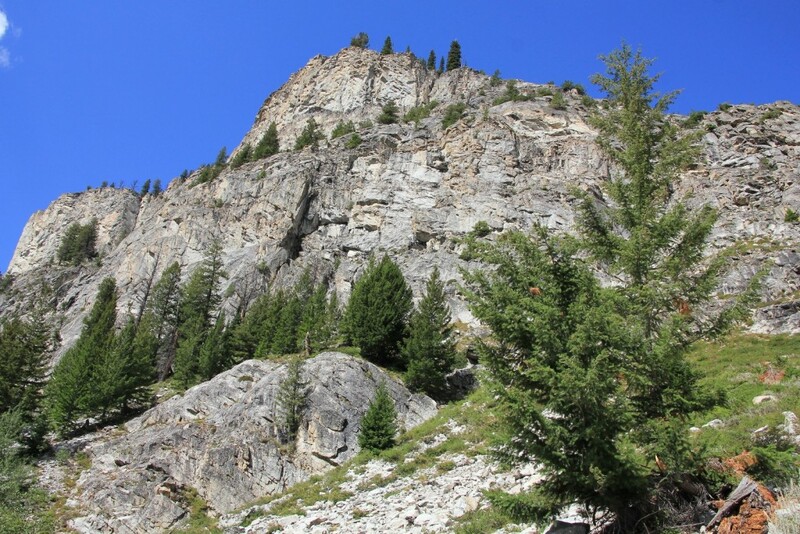 After passing the wilderness boundary, we started to get occasional views of the cliff walls and peaks to our right. 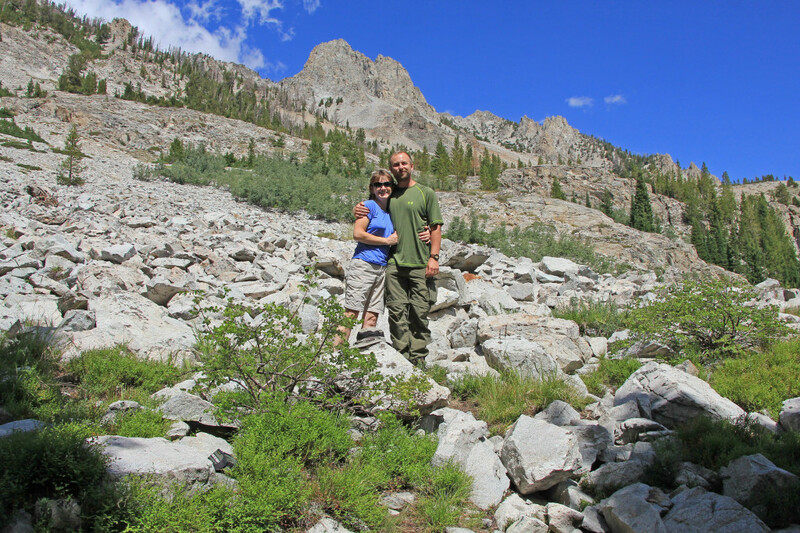 It reminded me of the Sawtooth Lake trail that we had hiked three years earlier with my good friend Lisa. At about three miles in, we crossed a creek on a large fallen tree. 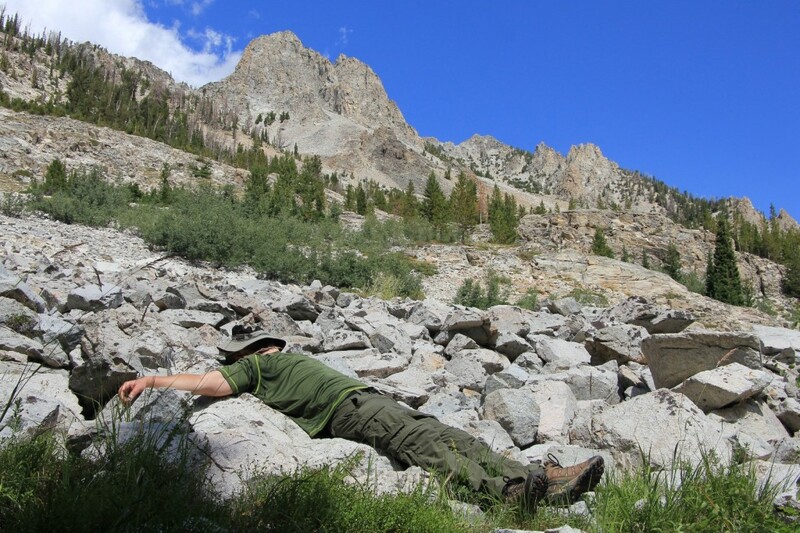 At a small meadow with cliff views, we stopped for a short snack break. Shortly after our break, the trail began climbing in earnest. The majority of the 1,600’ elevation gain came during this next stretch. Views became more breathtaking with each passing step, making the climb seem easy. We made several easy stream crossings and passed through several areas of talus and boulders where, to my delight, I could hear the familiar “EEEEK” of pikas. A backward glance revealed views of the White Cloud Mountains appearing to the east. 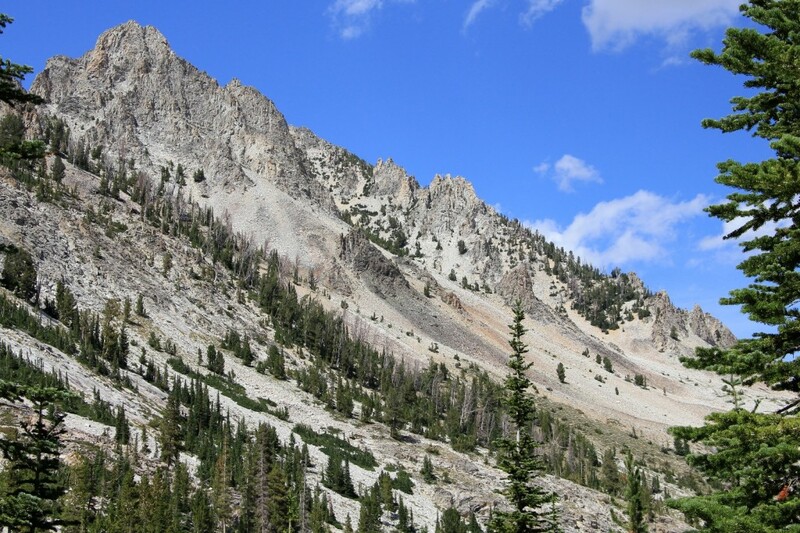 In front of us, the Sawtooth peaks were growing larger and even more impressive. We encountered two beautiful blue-green ponds. Their beauty only hinted at what lay ahead. 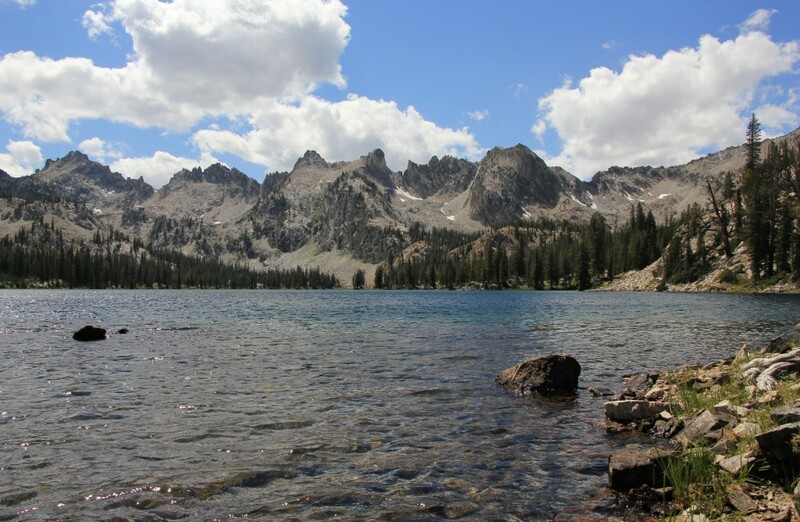 After 6.25 miles at an elevation of 8,596’, we reached stunning Alice Lake. Views were some of the finest we had ever seen. Jason set up and did a little fly fishing while I continued down the lake for shots. Fishing and shooting conditions were rough with relatively strong winds and harsh mid-day sun. It didn’t take us long to realize we’d be better off just relaxing and enjoying the view. The return hike was just as impressive as the hike in. The weather was perfect with temps in the 70s and mostly sunny conditions. We had great views of the White Clouds as we descended. This was indeed one of the top hikes we had ever done. The entire loop backpack to Alice Lake and over Snowyside Pass to Toxaway and Farley Lakes was already high on our bucket list. Doing this first leg moved the entire loop to the top of the list. After the hike, we decided to try a restaurant we had seen a few years prior on a trip up the Yankee Fork of the Salmon River. We drove through Stanley and continued north on highway 75. 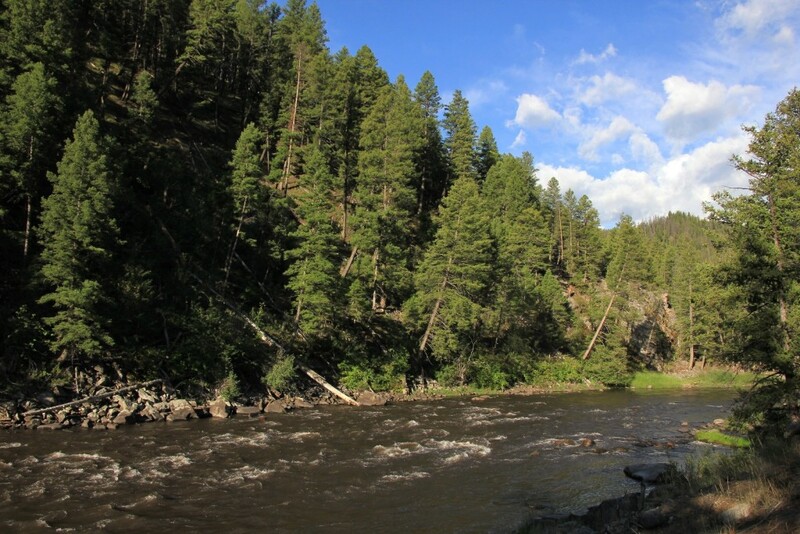 At the old Sunbeam Dam site, we turned off the Salmon River Highway north toward Custer. The restaurant was immediately to the left. Prices were a bit high by our standards, but very typical of the Stanley area. The burger was good and the women working there were delightful. A super sweet and professional young lady (maybe 10-12 years old) took our order and did a wonderful job. The other two adult women were very friendly and we enjoyed talking with them about the area. As a reward for our 12+ mile hike, we had some huckleberry ice cream for dessert. Saturday morning we were the first ones up in the campground for the second morning in a row. We had our cups of coffee, enjoyed our river view, and had a quick breakfast. 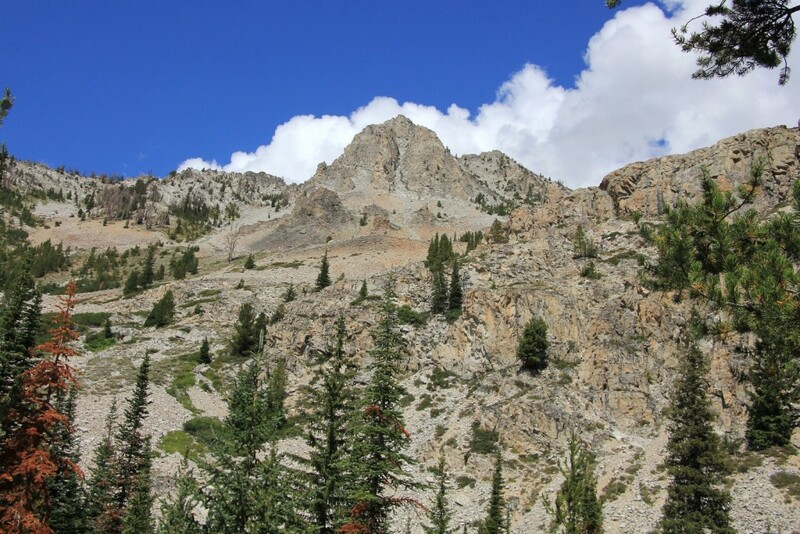 On Thursday, we had started talking about the possibility of pulling up camp Saturday morning and making the drive up through Challis and Salmon after our hike. Neither of us could recall ever making that drive and it sounded fun to see some new country. We decided it would be worth taking the chance of driving as far as Darby or Hamilton if we had to for a hotel. After breaking camp, we headed back to Stanley and drove south down highway 75 to FS road #210 (Decker Flats Rd). 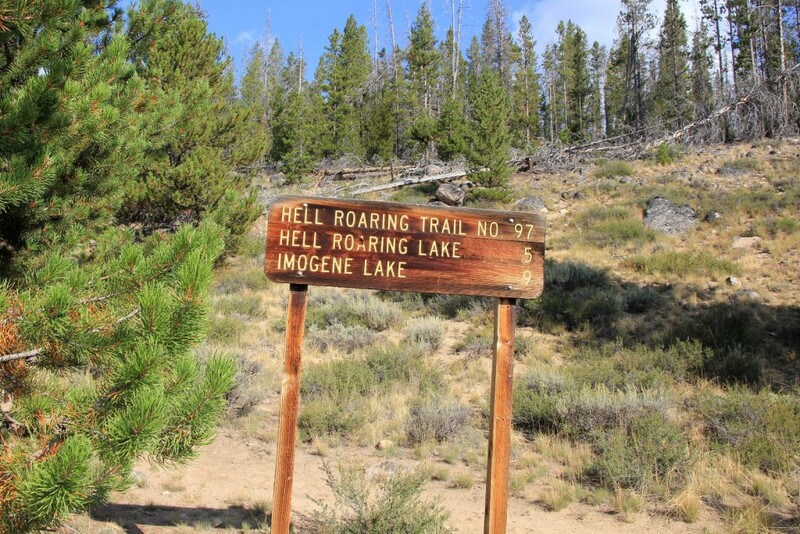 We drove a short distance, crossed the Salmon River, and parked at the lower trailhead to Hell Roaring Lake. 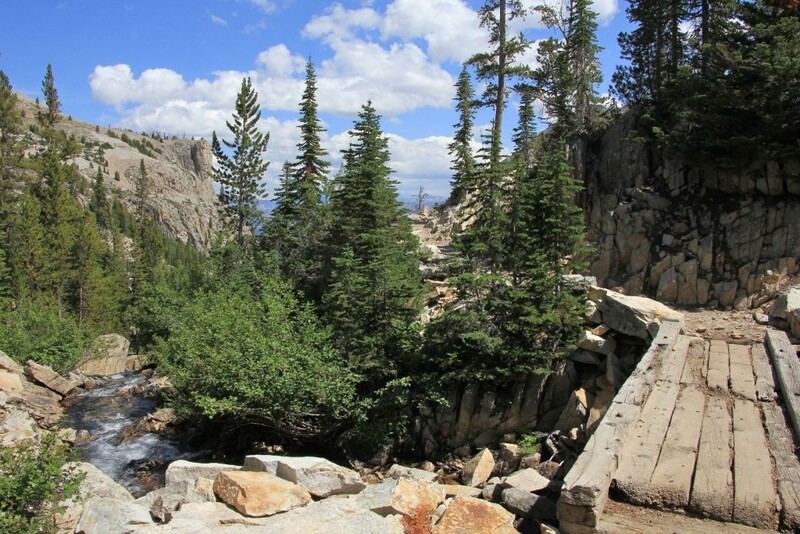 There is an upper trailhead that will get you closer to the lake; however, I’ve heard it is quite rough. It was a beautiful sunny day with no clouds, but it was a bit on the hazy side. 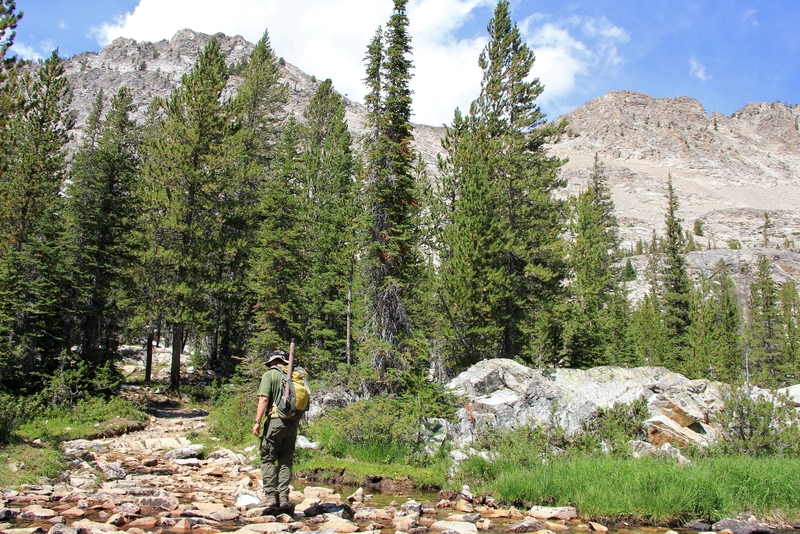 We grabbed our gear and hit the trail to Hell Roaring Lake. 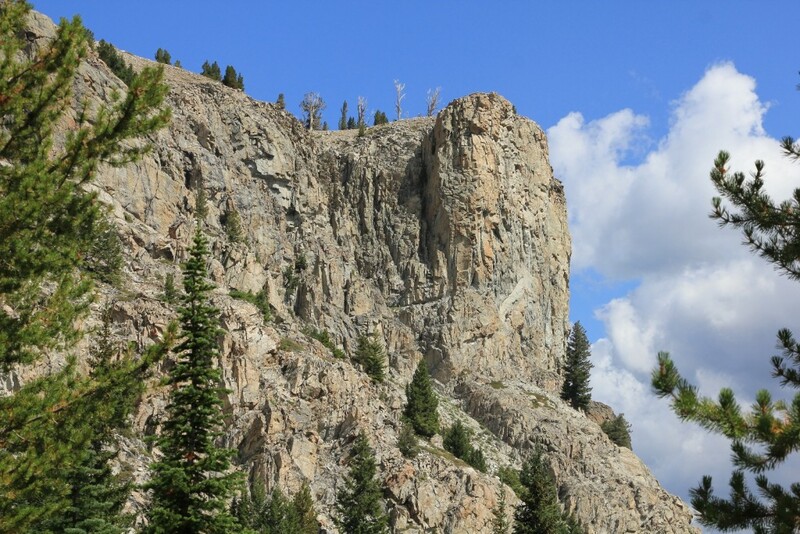 The trail starts at 6,800’ elevation and gains 600 feet, most of it in the first mile. This stretch of trail was scenic with nice views of Hell Roaring Creek which was quite pretty with clear water. Not long after topping out, the trail left the stream and the hike became quite pedestrian until the lake. We passed some burn areas, but even the unaffected areas had little aesthetic value. At least the hiking was easy and I knew the destination would be amazing. After a long seeming 5 miles, we reached Hell Roaring Lake at 7,407’ elevation. It was well worth the long trudge to get there. 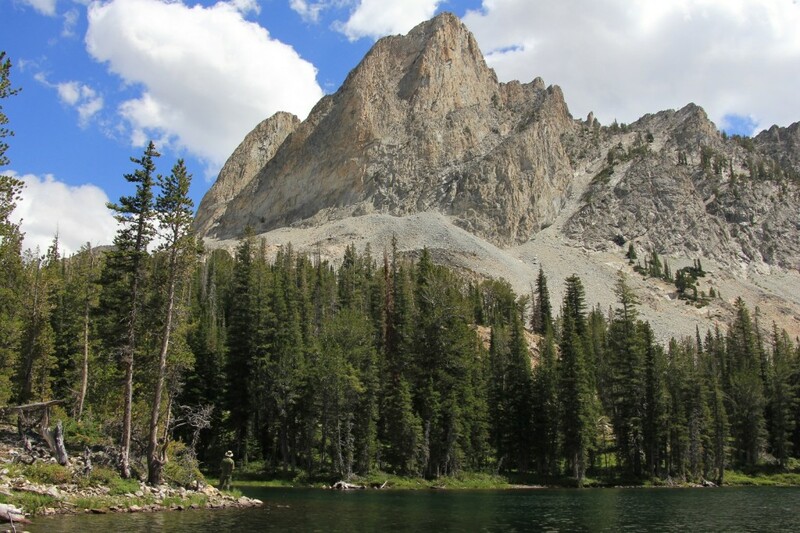 The lake was large and very beautiful with jagged Sawtooth Peaks behind it, including the Finger of Fate. Again, I wouldn’t get any reflection shots due to a breeze, but I enjoyed walking part way around the lake for shots. As I did, I saw several nice camping sites. The lake outlet was especially beautiful and there was a nice foot bridge crossing the stream. The hike out was uneventful. We saw a couple other people on the way in and a few more on the way out, but the trail wasn’t nearly as busy as I had expected. At the truck, we grabbed drinks and snacks to hold us over for the drive ahead. We hit the road at about 4:00 and set out on our adventure. We had no idea where we would end up that night. The drive down the Salmon River along highway 75 was incredibly beautiful. I could have spent a day just pulling over every few feet taking pictures. 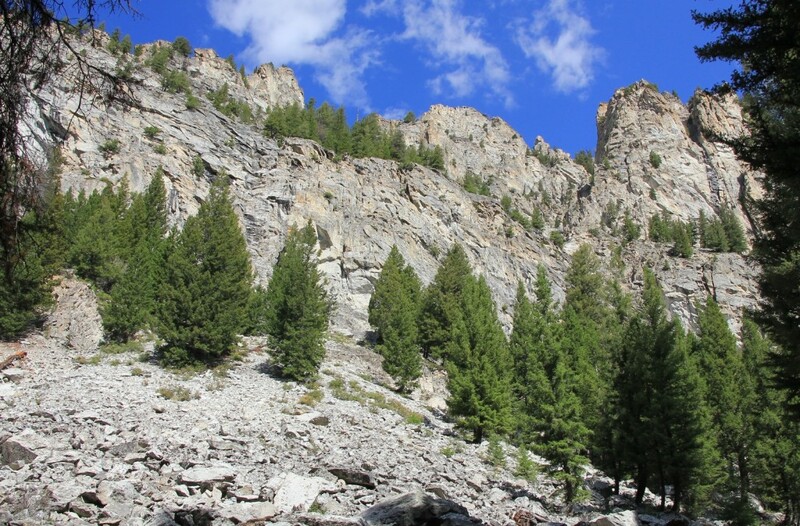 We expected rugged canyon walls and countryside. What we didn’t anticipate was the unique beauty of the rock formations. The colors were amazing- purples, pinks, reds, oranges, and greens. This was especially true of the stretch between where we had camped and Challis. Just south of Challis, Idaho, we turned north onto highway 93. The town of Challis was a nice little town in a pretty valley surrounded by mountains. Further down the river canyon, the town of Salmon was larger and nicer than I expected. It had an old west feel and quite a few hotel and restaurant options. It was tempting to stay there, but I wanted to make it a little further. I knew Lost Trail Hot Springs would be a real option, but I was hoping for some cute little lodge along the river before we hit the Lost Trail Pass. Not long after the town of Salmon, we rounded a bend and arrived at the tiny stop of North Fork, Idaho where the North Fork of the Salmon River flows into the main Salmon. There, on the river’s edge, sat a cute log cabin lodge with a vacancy sign. 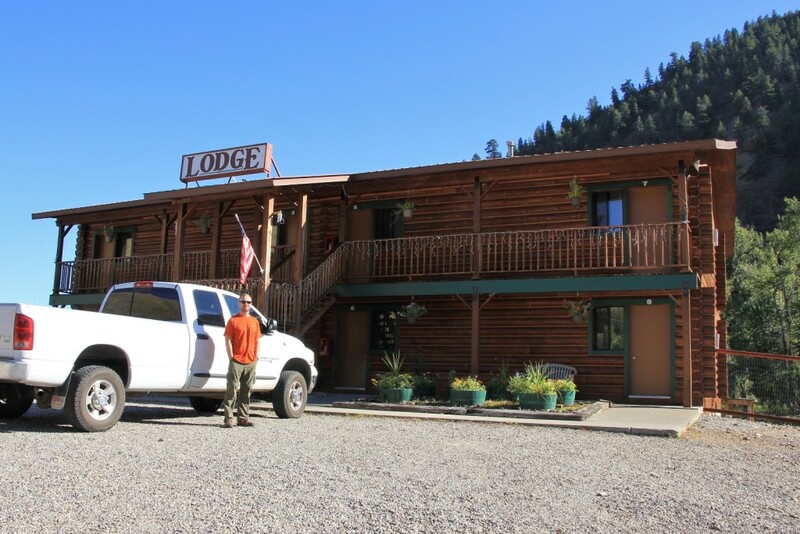 Ken, of River’s Fork Lodge, is one of the nicest and most outgoing hotel owners we’ve ever met. He introduced himself, asked our names, and shook our hands. He had one room available for $98 after tax. He offered to show us the room first, but we said it would work perfect. We asked about a restaurant. There wasn’t anything open at this tiny stop-in-the-highway-town, but there was a great burger and pizza place up the road that Ken highly recommended. Josephine’s was a real find. It was just 5 miles up the road and was located on the banks of the North Fork of the Salmon River. We sat outside on a deck just above the stream. Our waitress was very nice and the burgers were about as good as we’d ever had. Back at the lodge, we were thrilled with our room. It wasn’t anything fancy, but it was a huge corner room with a deck overlooking the Salmon River and it was very clean. Boy had we scored on the lodging and eats! We enjoyed a drink on the deck before settling in to bed. We slept with the window open all night, lulled to sleep by the sound of the river. The perfect end to a perfect couple of days on the trail. Great post Lusha! Alice Lake looks amazing. I’d still love to do the full loop with you guys. Maybe next summer? Yes absolutely Lisa!!! We’re still hoping to do this one with you!